The Hart Stone is a heartbreaking testimony to the harsh and often deadly conditions in the time of the Jacobite Rising in Scotland. Romantically portrayed in Diana Gabbaldon’s novels and Outlander, but these times were not easy to survive in, especially when there was no nurse from the future attending the sick. Death was imminent for the weakest in society, the old and the young, the infant death rate was high. 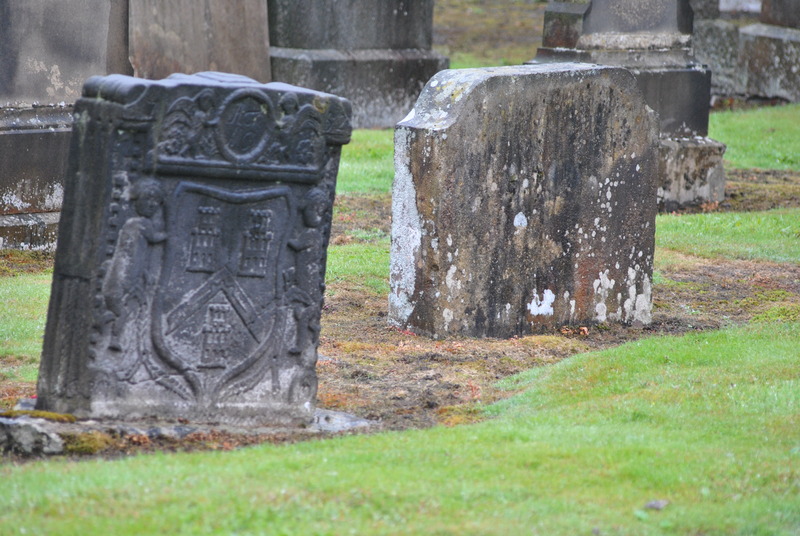 The Hart stone marks the grave of four sisters who all died young. Here lyes Christian Hart daughter to Robert Hart Mason in Reading she died May 8 1745 aged 2 years. Also Mary Heart died October 19th 1752, aged 3 years … months. Also Janet Heart died September 2 1760 aged 2 years two months. Also Helen Hart died July 26th 1766 aged 11 years. The Hart family lost two toddlers, a three-year-old and an eleven year old, all were girls, four of them died a few years away from each other. What caused their deaths? Were they suffering? What did it mean to their parents? The mason Robert Hart had faced the death of four daughters in difficult times. 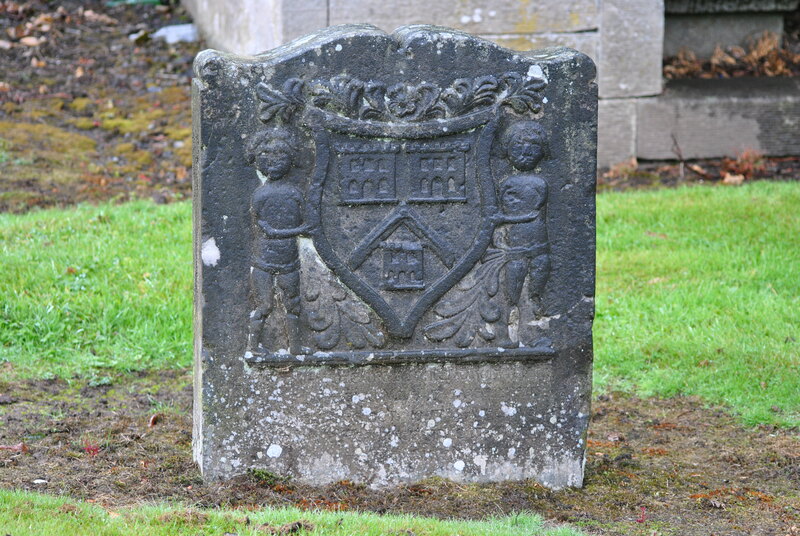 The Hart gravestone is not far from the oldest in the Churchyard, it dates back to 1734. Charles Edward Stuart was in Naples then, gathering his first and indeed only experience in warfare before the Rising during the War of the Polish Succession. 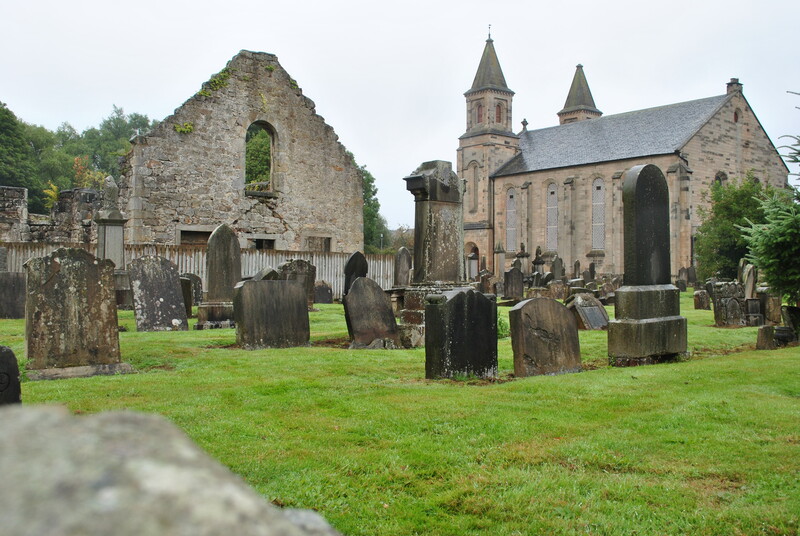 The Temptation Stone is younger than the Jacobite Rising. There are actually two in the graveyard. These kinds of stones, also called Adam and Eve stones, can be found all over Scotland but not very often. The tree with the snake and two figures is a rather intricate design and was probably a challenge for most masons of the day. The churchyard is considered unique by having two Temptation grave – stones within its bounds. 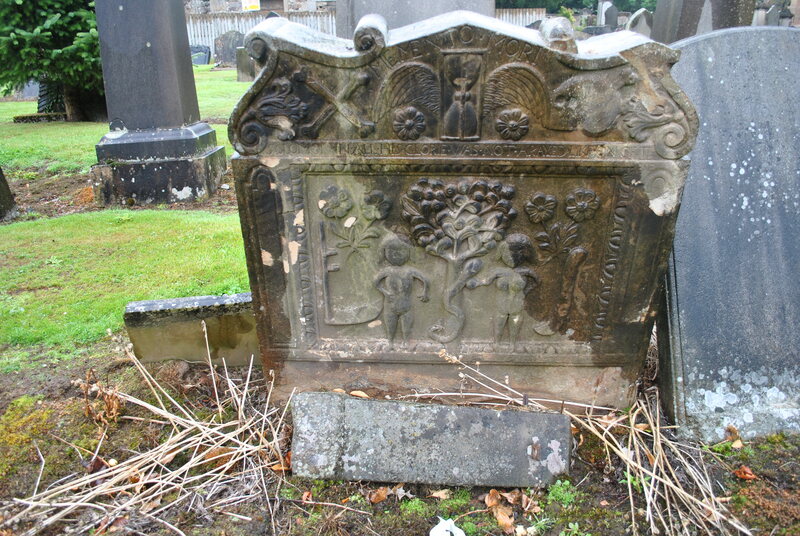 The subject is symbolic of early Christian Celtic times, and both stones, carved in strong relief, depict the Tree of Life with fruit and leaves, and a serpent twined around the trunk. Eve stands to one side and is shown taking fruit from the serpent and handing it to Adam. Around it are carved gardeners’ tools and a lily bearing the inscription, “Solomon in all his glory was not arrayed like one of these.” One of the stones, dated 1790 on the reverse side, lies against the south boundary wall while the other, which bears the date 1754 on top, lies west of the old church.